I'm compelled to admit it: I tried a Katniss braid. I can't even do something so simple as a wildly popular teenage-film hairstyle. You see, the french braid across the back of the head diagonally is actually supposed to be an inside-out french braid, not a regular one. Oops. Negative points for trying to be a teenager again. Especially when I have no real idea who Katniss is other than that she's somehow related to the Hunger Games. But all of that aside, I loved this mix of colors and textures for spring. 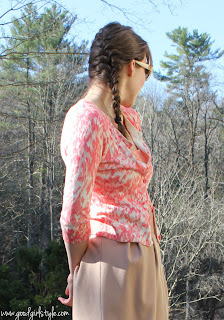 A sequined tank top, patterned cardi, and wool tulip skirt and some cowboy boots. French braiding is so hard!!!!! It makes my fingers hurt! I have read the books... good try!!! these loans may also be to get repaid in smaller installments.